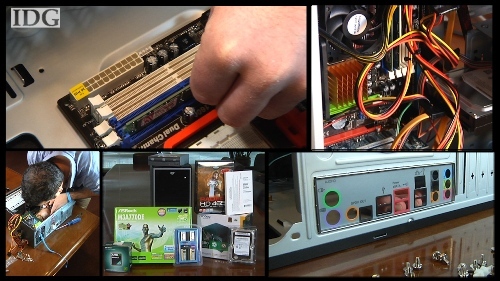 Without taking precautions, it’s possible to damage delicate PC components with static electricity. To avoid this, ground yourself by wearing an antistatic wrist strap attached to a piece of metal on your case. Next we’ll add the CPU to the motherboard. Lift up the latch on the socket and then line up the CPU in the correct position. The CPU will only install one way and will be damaged if inserted incorrectly. Once the CPU is seated, close the latch to secure it. Figure out which slot on your motherboard you want to install the video card and punch out the corresponding metal panel on the back of the case. Insert and secure the card then use a screw to attach it to the back of the case. This will make sure the card doesn’t move when attaching your monitors. Choose a slot for your CD-DVD drive, slide it in and secure it with screws. 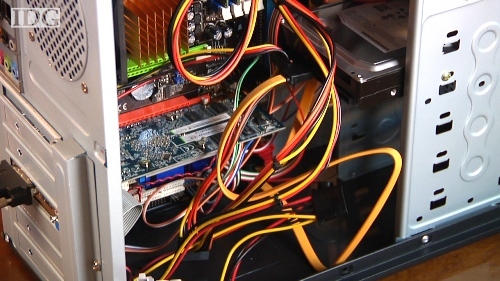 You’ll need to attach the drive directly to your motherboard using a SATA cable. Also be sure to attach it to the power supply. You’ll do a similar install process for the hard drive, except it will be mounted at the bottom of the case since you won’t need to access it from the front panel. Slide the drive into the slot, secure it with screws, then attach it to the motherboard with a SATA cable and plug it into the power supply. 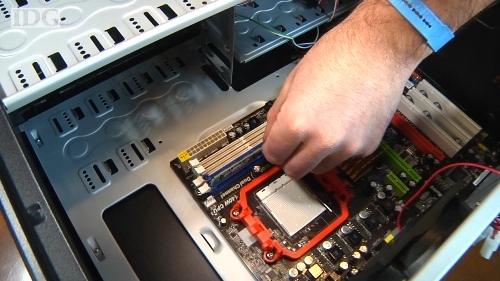 One of your last tasks, and one of the more challenging parts of the install, will be connecting the case headers to the motherboard. This includes the power and reset buttons, front audio and USB ports as well as any lights on the case. It’s best to consult the motherboard manual before completing this process to be sure you’re using the right headers. Once you’re done, you’re ready to boot up, but don’t seal your case just yet. Leave it open in case you need to make any changes.